Not what you may be thinking...this is not lush pasture that the horses are turned out onto 24/7. Unfortunately, situations like that can lead to trouble. This "paradise" is set up to encourage movement and provide some varied terrain, the concept Jaime Jackson writes about in his book Paddock Paradise: A Guide to Natural Horse Boarding. In November 2006, we had pea gravel delivered for the dirt paddock/dry lot. 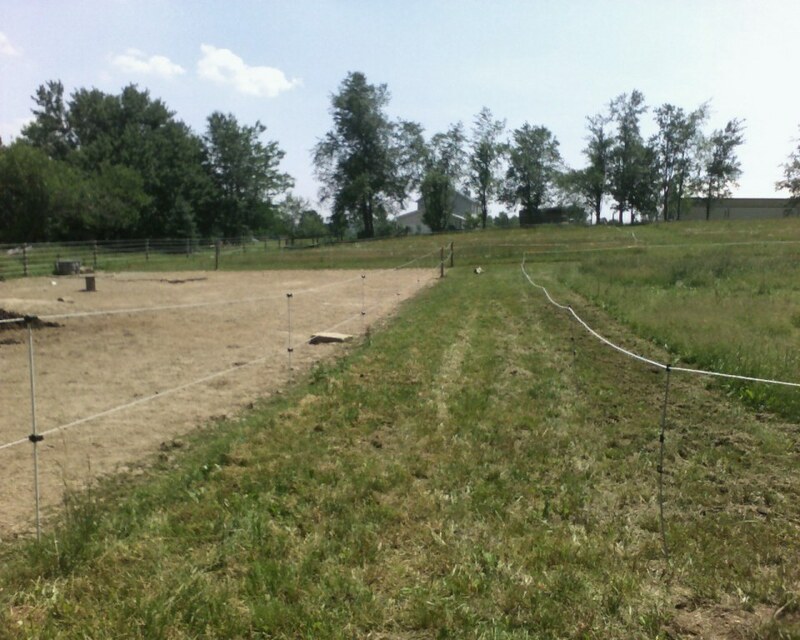 We first prepared a large area outside the barn run-in and a smaller area around the water trough. 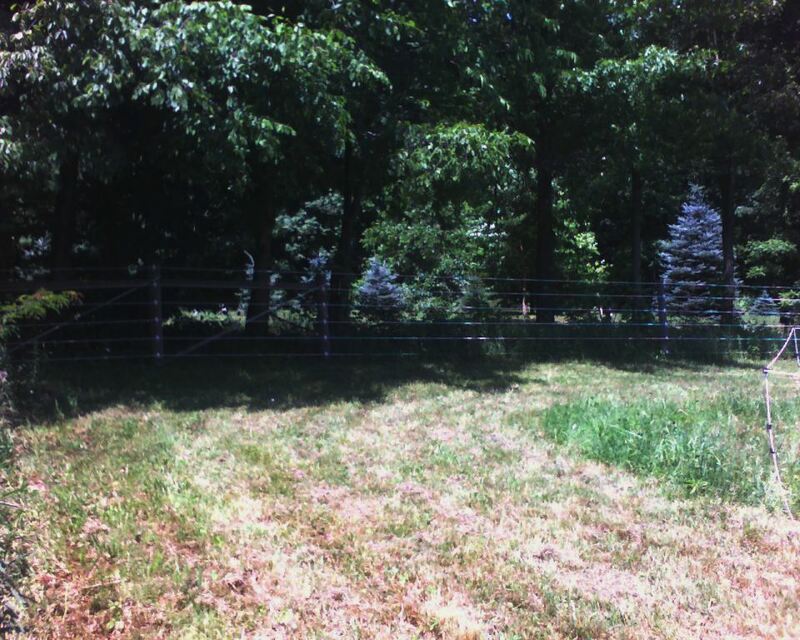 Nick scraped and removed the loose ground, then we laid down landscape fabric. We spread the gravel to a depth between four and six inches deep. It was an immediate hit with the animals! The pea gravel areas are comfortable to stand and lie down on, and it provides excellent support and stimulation to the bottom of the horses' feet (Dr. Robert Bowker did a study showing the effects of different footing on the hoof and circulation, pea gravel proved to be one of the best). It also solved part of the deep mud issue. I clean the gravel areas frequently, removing any manure piles as soon as I can. If I get to it before everything is trampled, it is quite easy to muck out. I use a typical bedding fork, which picks up the horse poo yet most of the gravel sifts right through. It is like cleaning a giant kitty litter box! The horses seem to really enjoy the track system. It is helping immensely with their mental and physical health. It’s a huge improvement to part-time dry lot containment, which is what they had to deal with prior to setting up the track. 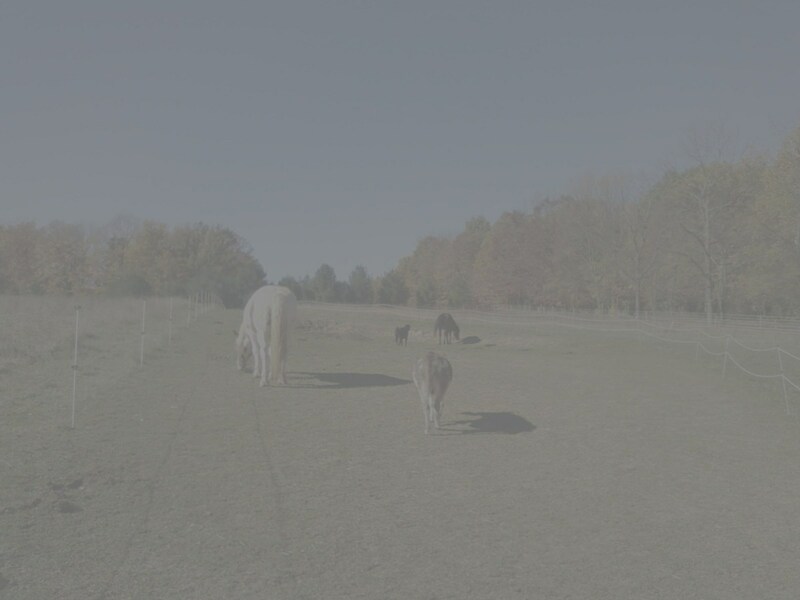 The past few years, the “easy keeper” status of my horses was becoming worse, and there was no way they could be allowed to graze constantly on pasture unrestricted (sugars can wreak havoc on a horse – Safergrass.org is a valuable source of info on this!). They were metabolically challenged, and were on the way to Insulin Resistance if not already at the early stages. At first, I tried nearly 24/7 turnout with grazing muzzles. This seemed to work at first, but then they started to gain weight despite reduced ability to graze. 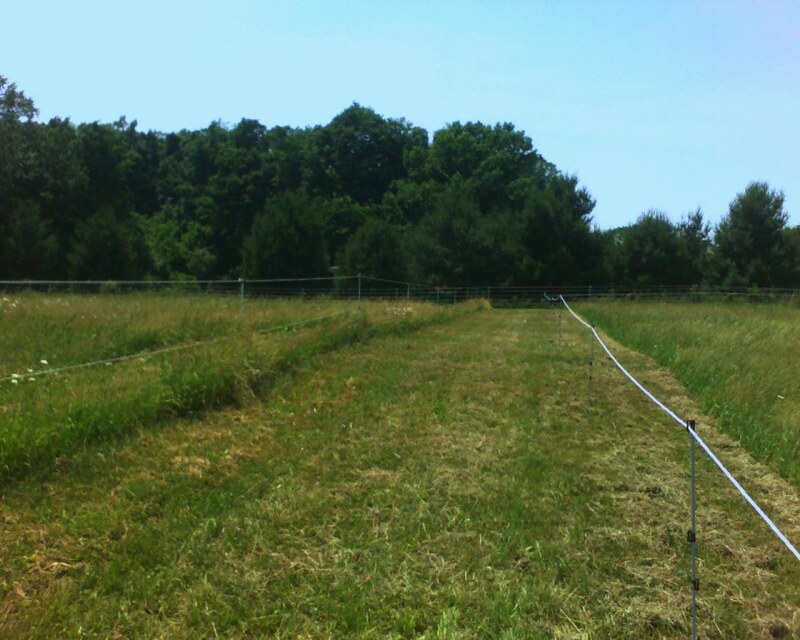 So, I alternated paddock/pasture time in muzzles in order to further limit grass intake. Unfortunately, while in the dry lot, they would just stand around most of the time waiting for their next “meal”. Then when turned out on pasture, they would move, but barely. They wanted to eat, and food was everywhere! For the most part, they would stand with noses to the ground, reaching as far around as they could before bothering to take a step. So this management routine limited their grass/sugar intake, but seemed to reduce movement as well. Movement is crucial for the health of a horse. 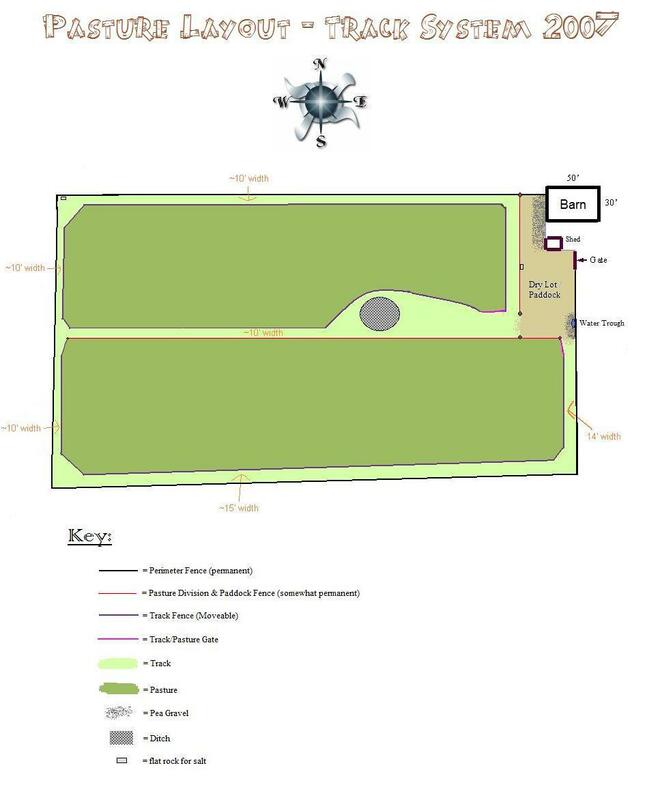 The track system allows them more space and different viewpoints, and encourages them to move throughout that space. When I first let the animals onto the track, they practically raced around it, wondering what was further ahead! Initially I put the horses’ grazing muzzles on because the lanes were still grass. 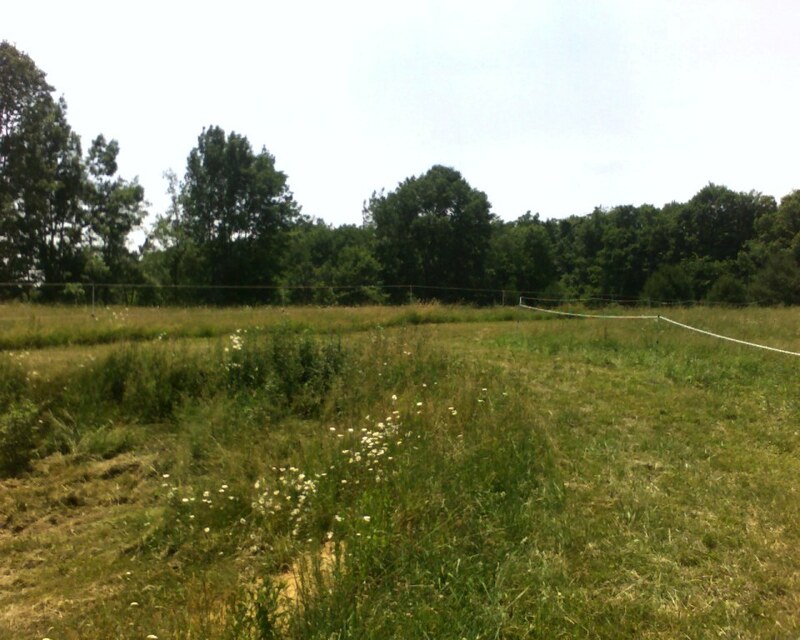 Once they had it grazed pretty short, I let them out on it without the muzzles for limited timeframes, gradually increasing that time. Soon they were on the track 24/7, muzzle-less and happy. During grazing season, I turn the animals out into one of the center pastures periodically throughout the day. In the winter (and late fall and early spring when grass sugars typically peak), I feed grass hay. I spread it in many small piles throughout the track whenever possible. This really gets them moving, especially if Cocoa is in front of Bob. Bob pretty quickly wants Cocoa’s hay, so he leaves his pile behind to get it. Cocoa moves on to avoid conflict, and the cycle repeats, pile after pile. Rain and Boomer either eat with someone (Bob usually), or are ahead (pushed by Cocoa who is pushed by Bob), or follow fairly closely in order not to be left behind. Since this then results in hay left the first lap around, they wander the track again. They get a lot more movement and it takes them longer to eat, so they are not as bored. I am thrilled! 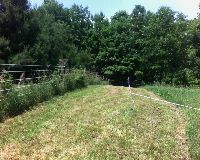 To help prevent the hay from blowing away in certain windy conditions, I attached sections of plastic chicken fence to step-in posts and placed them in a few wider locations on the track that I can set the hay beside. There are then not as many piles of hay to wander to and from, but it is better than feeding in the barn. If it is quite muddy, I unfortunately do have to resort to feeding in the barn, where I make as many hay piles as possible. If it is too mucky outside, I sometimes close off the track and restrict the animals to the paddock, to protect the lanes from getting too ripped apart. These situations really remind me how beneficial the track system is! 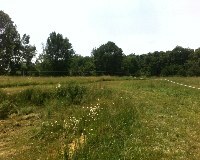 Preparation for track system installation: Nick mowed where I wanted the paths. This is the lane farthest north, looking from east to west. Here Andrew is helping to run the top strand of electric rope fence through fiberglass step-in rods. This is again the farthest north lane, this time looking from west to east. 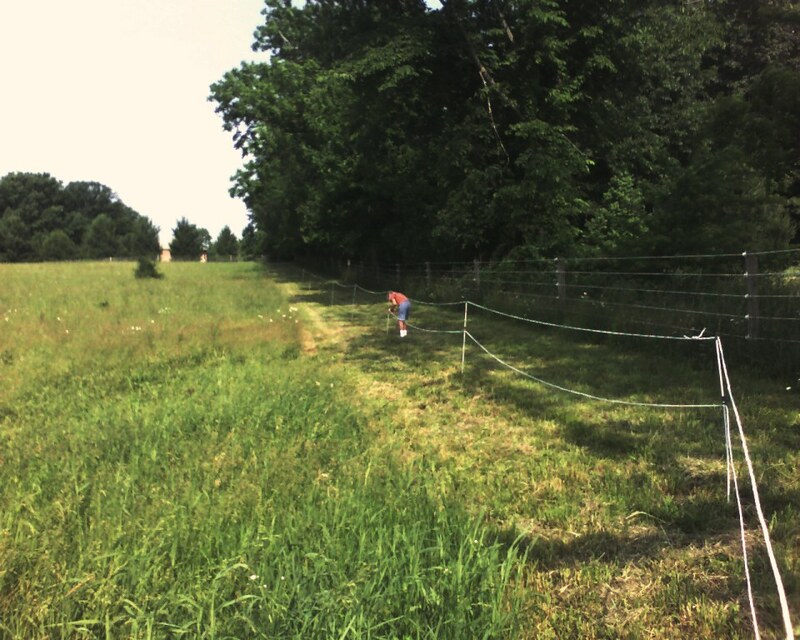 Andrew is helping to run the second strand of fence in this pic. Once again, this is the north lane, looking from the east lane to the west. Let's take a short tour! Please note: the track system is no longer grassy as in these photos. They were taken during installation, before it was grazed short and traveled so much by animals day in and day out. They are well-worn paths now. I will try to get more recent pix up soon. This is the center lane, looking from east to west from the gate of the paddock/dry lot. 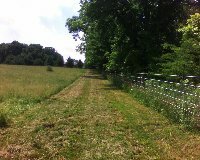 The (closed) gate to the north pasture can be seen in the track fence. The path is wider, and diverges around the ditch...the animals can go around either side or through it. 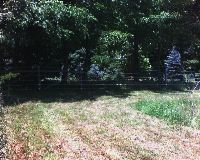 (In-progress pic- only the top strand of fence was run at the time). You can see (barely) the pasture divider fence on the left side of the pic, which is now one barrier for this lane. This is the center lane heading west (southwest at this particular section! ), taken on the right-hand side of the ditch (seen to the left). 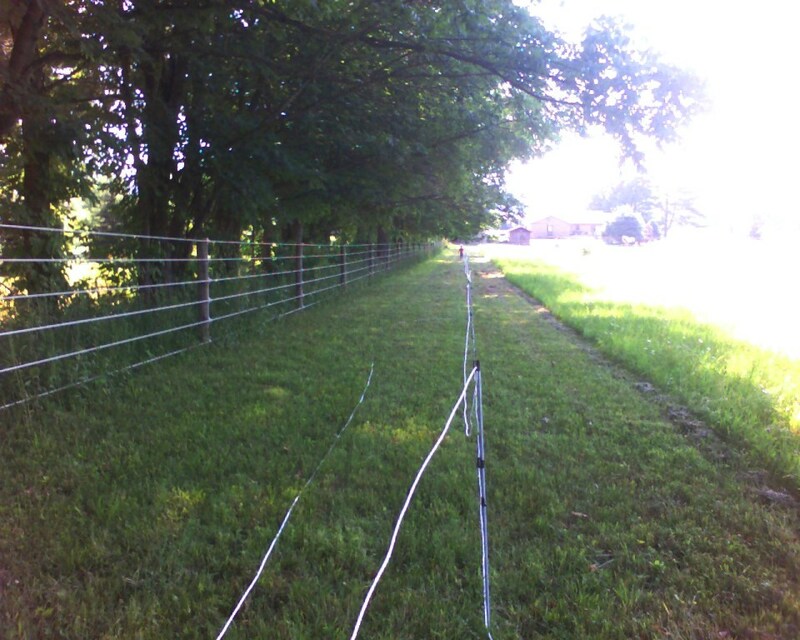 Again, the track fence was not complete here, only the top strand was run. In the background, the pasture divider fence can vaguely be seen. The center lane again, looking east to west, after passing the ditch. 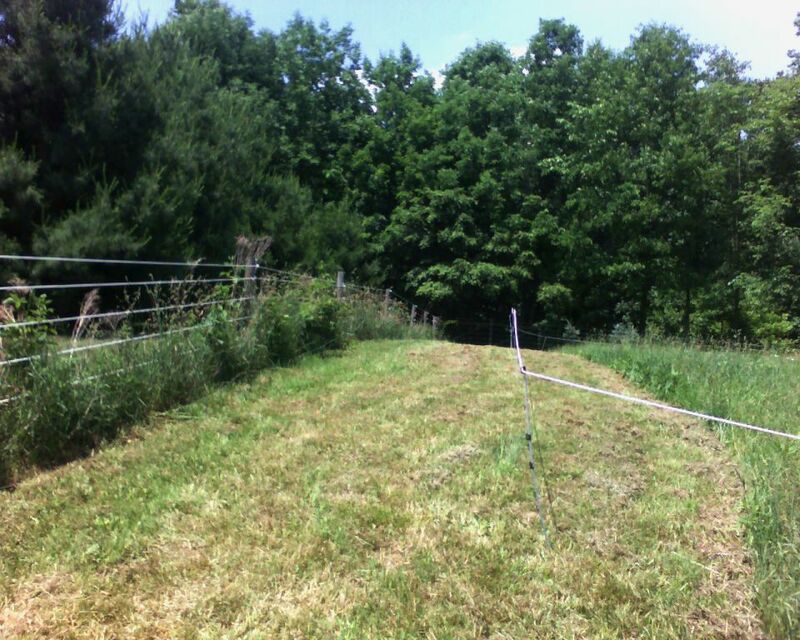 Again, only the top strand of track fence had been run, and the pasture divider fence is on the left. Turning right off of center lane onto west lane, heading north. Northwest corner, wider loafing area. Taken at end of west lane, right turn onto north lane. North lane taken at northwest corner looking east. The east lane looking south, taken at the northeast corner. 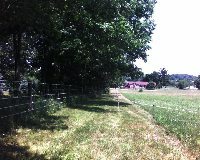 The paddock/dry lot is on the left, the gate where we started the "tour" is near the center of the pic. 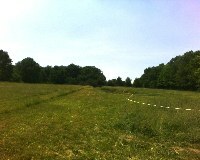 Further to the left of that gate is the other gate, which leads to another section of the track system (pix to come! ).